WASHINGTON — Two years after a scandal over long wait times for veterans seeking health care, the Department of Veterans Affairs still has “profound deficiencies” in delivering health care to millions of veterans, a congressional commission says in a new report. The Commission on Care says in a report to be released Wednesday that the VA delivers high-quality health care but is inconsistent from one site to the next, and problems with access remain. Congress created the 12-member commission in 2014 after approving a landmark law overhauling the VA in the wake of the wait-time scandal, which also revealed that VA employees were covering up chronic delays with false paperwork and secret waiting lists. As many as 40 veterans died while awaiting care at the Phoenix VA hospital, according to an investigation by the VA’s inspector general. President Barack Obama said in a statement late Tuesday that the commission’s report includes a number of specific proposals that he will review closely in the coming weeks. VA Secretary Bob McDonald also hailed the report and said he was pleased to see that many of the panel’s recommendations are in line with ongoing efforts to transform the VA into what McDonald calls a “veteran-centric organization.” The report found that the long-term viability of VA health care is threatened by problems with staffing, facilities, capital needs and information systems. Work on that effort has been underway for two years and has resulted in increased access to health care and a better experience for veterans, McDonald said. In March, the VA set a new record for completed appointments: 5.3 million in VA hospitals and clinics, 730,000 more than in March 2014. The VA also issued twice as many authorizations for government-paid, private care than in a comparable period two years ago, McDonald said. Nearly 97 percent of appointments are now completed within 30 days of the veteran’s preferred date, McDonald said, a huge improvement over past performance. 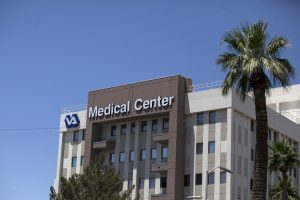 But the report said the VA has a long way to go and singled out a “Choice Program,” authorized by Congress to make it easier for veterans to get private care, as significantly flawed. The report recommends replacing the program with community-based delivery networks that it said should improve access, quality and cost-effectiveness. The commission also found that the long-term viability of VA health care is threatened by problems with staffing, facilities, capital needs, information systems and other problems.